If your firm charges late fees or finance charges, they will need to be configured in the Late Fees section of the Global Invoice Settings screen. This will ensure that the Late Fee dialogue and late fees on your invoices will be correct. To access the Late Fees section of WorkSpace, navigate to Setup > My Company > Information & Settings > Invoicing and select the “Late Fees” tab. If you would like late fees to be added to your invoices automatically, enable the “Calculate Late Fees on New Invoices” option. This is not recommended for firms which assess late fees on a situational basis. If your firm is charging interest on the balance of unpaid late fees, enable the “Calculate Interest on Interest” option. 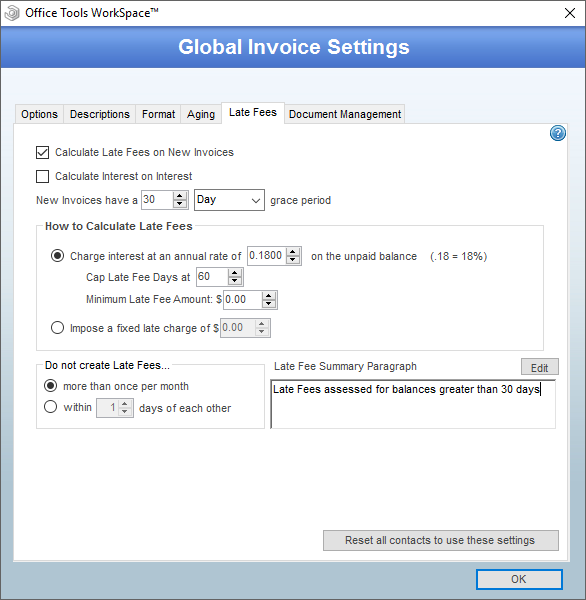 To set the terms of your invoices, enter the value in the “New Invoices have a … grace period.” If your invoices are due on receipt, enter “0” days. Otherwise, you can enter the appropriate days or months. This will ensure that invoices will only accrue interest after the specified length of time. The first option will calculate late fees on a daily basis based on the annual percentage you have entered. For instance, if an invoice of $100 and dated August 1st has not been paid as of September 1st and you are charging 18% annually with a 0 day grace period, the late fee will be calculated as $1.53. The annual percentage results in approximately 0.049% being charged for each day with 31 days being in August. You will be able to see the calculation details for each late fee per client. The “Cap Late Fee Days at” value is used to control how many days are taken into account if a late fee invoice is being created for an old balance. For instance, if this value is set to 30 days, an invoice which is 90 days old will only receive a late fee worth 30 days. This value is set to 0 by default. In order to prevent minuscule amounts from showing up in your late fee invoices, you can enter a minimum fee in the “Apply a minimum Late Fee of … ” field. The second option will assess a flat fee whenever a client has an overdue balance. Please note that any percentages entered here are to be entered as decimal values, e.g. 18% should be entered as 0.18. To customize the description of your Late Fee Only invoices, enter your firm’s standard paragraph in the Late Fee Summary Paragraph field.